The “symbolic” end of summer, Labor Day, is quickly upon us. What an ultra running summer it was, but boy did it blow by way too fast. Labor Day also signals some down-time for TWIR, and thus, to keep you comfy for a few weeks while we are away, we offer to you today this special double-edition, double-feature TWIR, covering events taking place the weekends of August 20th and 30th, and September 5th and 6th. We begin, as always with the 100-mile events, starting with the Cascade Crest 100 Mile Endurance Run (Saturday, August 29 in Easton, Washington). The course is a clockwise loop featuring 20,470 feet of total elevation gain. 75% of the course is run on trail, with the remaining 25% on dirt road. There is a slight course change this year from those prior. Due to the closure of the Snoqualmie Tunnel, the route from Olallie Meadows (mile 47) to Hyak (mile 53) will be new. This means no ropes section and no tunnel. The course now traverses Snoqualmie Pass from west to east pack Rockdale Lake, then down the ski hill to Hyak. In its 11th year, Cascade Crest will have its largest starting field ever, which filled in a mere 3 days after registration opened. Its reputation is as a tough and scenic 100 miler. The weather can get hot – in 2006 the temps reached into the 90s, and so far 2009 has been one of the hottest and driest summers on record in Seattle. Also, watch out for the bees. Yes, that’s right, the bees. The Cascade Crest Runner’s Manual specifically warns about bee stings. “Be prepared for bee stings and do not run if you have concerns about an adverse reaction…..the first 30 miles of Cascade Crest tends to have a few angry bees each year…..if you have concerns about how your body will react to bee stings, talk to your doctor and carry any medications you think you might need to deal with an adverse reaction“. Uh, ok….Gu….check….water bottles….check….dose of epinephrine ????? The men’s course record was set in 2005 by Todd Walker (19:52), and the women’s in 2007 by Darcy Africa (21:15). On average, somewhere around 68% of starters finish the race. Last year’s winners were Tom Ederer (20:49:40) and Suzanna Bon (23:06:13). Neither are listed on the 2009 entrants list. Next up, the Grand Teton Races, featuring 100-mile, 50-mile, trail marathon, and 10k options, takes place on Saturday, September 5 in Alta Wyoming. A family and crew friendly race, the 100-mile course is a 25 mile clover-leaf loop (4 times for the 100-milers, twice for the 50-milers, and once plus an additional 1.2 mile section of trail for the marathoners), with roughly 4,975 feet of climbing per loop. The terrain includes single-track trails, service roads, bike trails and a short (but scenic) 3.2 mile stretch of pavement (per loop) with beautiful meadows, valley vistas and several dead-on views of the Grand Teton, the highest mountain in Grand Teton National Park, and the second highest mountain in the State of Wyoming. The course abounds with rolling hills, steep climbs and loose rock. The course has 9 aid stations per 25-mile loop, with the longest distance between aid stations being approximately 3.9 miles. As previously mentioned, it is a clover-leaf loop. Section A (Fred’s Mountain) is the steepest, most difficult section of the course. Runners must climb 1,840 feet over 2.8 miles to the top of the mountain, which includes a few technical, rocky sections as they get closer to the top. After summiting Fred’s Mountain (9,840 feet), runners face a quad-jarring descent back to the main aid station. Section B (Mill Creek Trail) is a 14.4 mile loop that takes runners on cat-track/dirt roads, single-track trails, dirt/gravel roads, and about 3.2 miles of pavement. The pavement section (a climb up Ski Hill Road) includes some very sharp, blind curves which are quite dangerous, although runners will experience some amazing views of the Tetons in this portion of the course. This section includes several challenging climbs. Section C (Rick’s Basin) comprises the final 5 miles of each 25-mile loop. This section is the least difficult of the three sections, and features service roads and trails. When entering the top of the basin in the evening, runners will be able to see the head lamps of other runners winding their way through other parts of the basin. There is only one aid station in this section, and it is unmanned with water only. 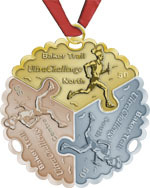 The fifth annual Baker Trail UltraChallenge will take place on Saturday, August 29 in Summerville, Pennsylvania. This 50-miler is run on the Baker Trail and has a 14 hour cut-off. Runners follow the Baker Trail South for 42 miles to Plumville, then turn north over rolling country roads to Smicksburg, ending at a private farm. The 2008 race course traversed the North section of the trail, while this year’s event covers the central section. The Baker Trail is marked as a typical hiking trail, but it not always a footpath through the woods. Many sections contain dirt or paved country roads, some with narrow shoulders. Thus, runners must always be watching for blazes in order to stay on the course. Lake is designated a National Natural Landmark. The parks 1,756 acres offers miles of hiking and biking trails, a golf course and a beach. Oh, oh, oh…a Pacific Coast Trail Runs event ! There always seems to be one, and there is on Saturday, September 5th in the Redwood Park Trail Run. 50k, 30k, 20k and 10k events travel through the beautiful Redwood Regional park, featuring spectacular views along the East Ridge and West Ridge trails, and winding through tall redwoods on the popular Stream and French trails. 4,500 feet of elevation gain awaits the 50k runners. There are sure to be plenty of additional events to choose from over the course of the next few weeks, but it is time to start packing for our end-of-summer vacation, so these will have to hold you over until we return with another edition of This Week In Running. Enjoy the rest of the summer…and Happy Running ! Some of these runs sound amazing. To be able to go that far along such beautiful trails would be great. I started running early in the morning and loved the cool air.